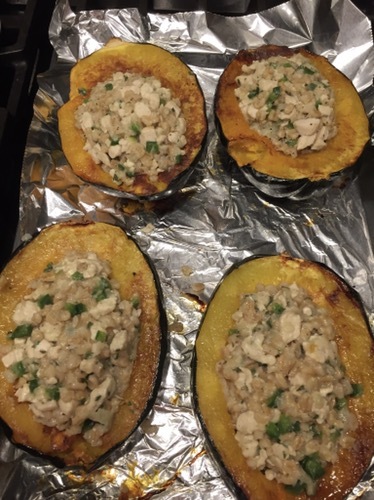 I have always loved squash, as much as my sister hates it, so when it’s in season we tend to use it frequently. 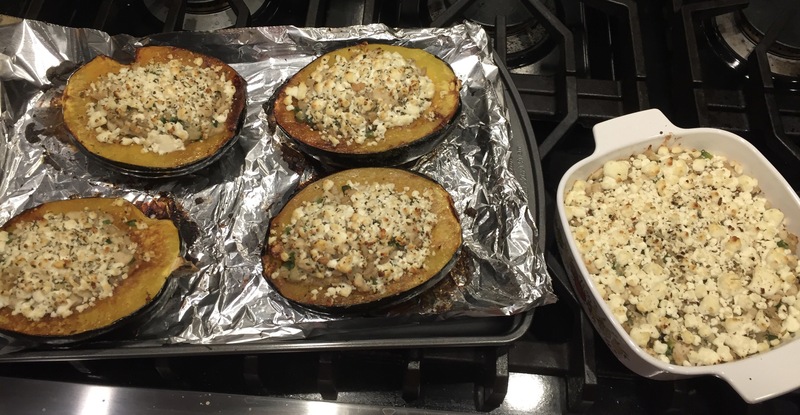 Stuffed squash is a great option for aqorn squash because you have your whole meal in one dish. 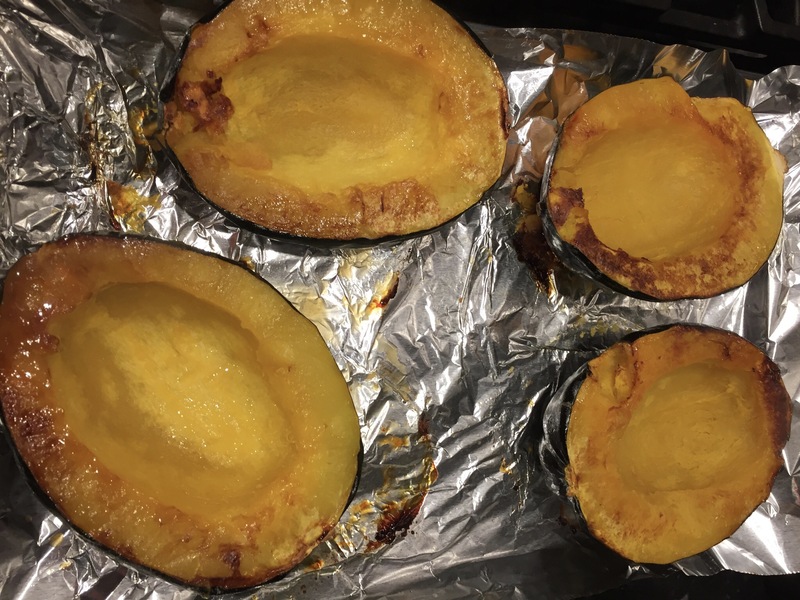 This recipe makes enough filling for 3-4 squash, I only make two (1/2 squash for each of us) and I bake the additional filling for leftovers. I start with cooking the barley and roasting the squash halves (seeds removed) with the cut side down until they are fork tender. 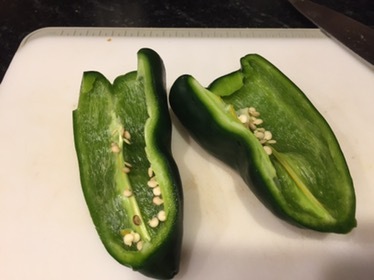 While they roast, I prepare the filling. 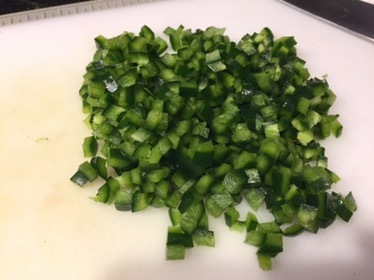 We prefer a bit of spice, so I use a seeded poblano pepper, but you could substitute with a green bell pepper for a milder flavor. 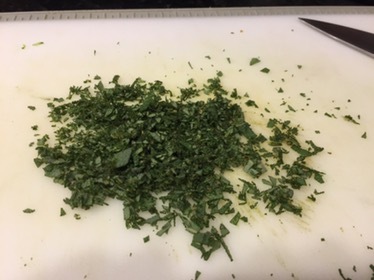 The chopped sage lends another element of fall flavor. 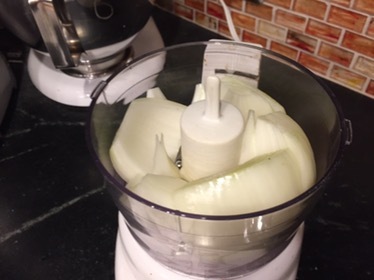 The sweet onion I simply chop in the food processor. 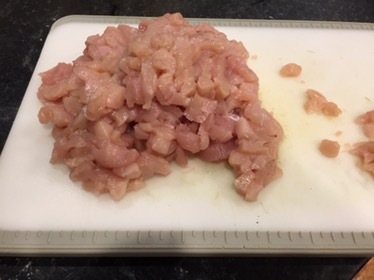 Last I dice the chicken. 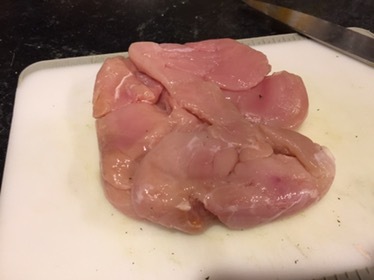 I use The same cutting board throughout, by doing the chicken last I prevent contaminating the vegetables with the raw chicken. 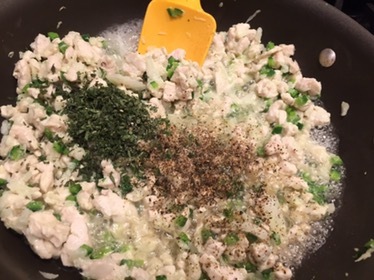 Sauté the chicken, onion, and peppers together until the chicken is starting to cook. 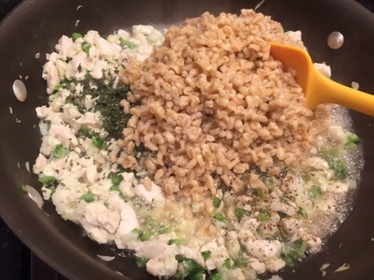 Then add salt, pepper, the sage, and cooked barley; continue cooking until the chicken is cooked through. By this point the squash will be done, flip them over and fill them with the stuffing. 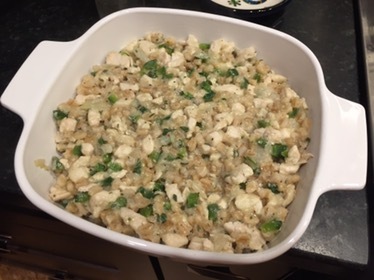 Set any extra in a baking dish. Top it all with goat cheese and bake. 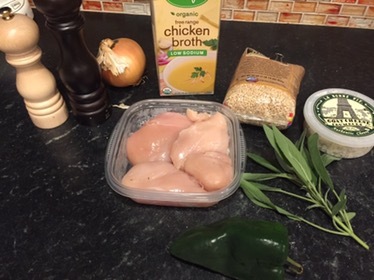 Bring the chicken stock and barley to a boil in a medium saucepan over medium-high heat. 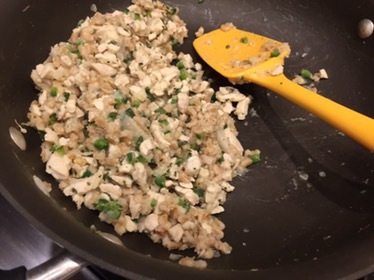 Cover, reduce heat to low, and simmer until tender, about 50-60 minutes. 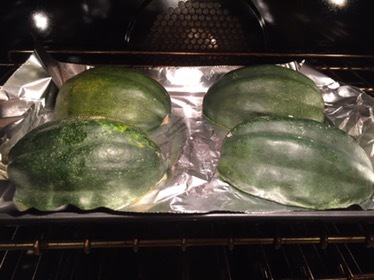 Scoop the seeds from each squash half and place, cut sides down, on a foil-lined baking sheet or a baking dish sprayed with olive oil. 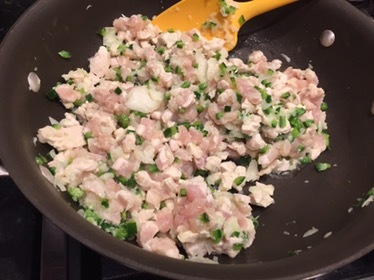 Bake for 30-40 minutes, until flesh is tender. 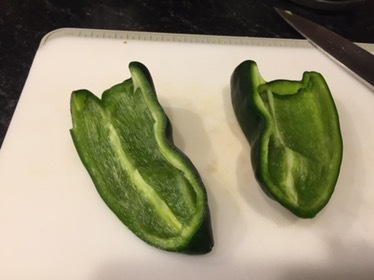 Remove from oven and flip to cut side up. 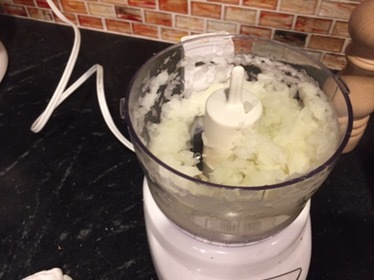 Meanwhile, heat the oil in a large saucepan over medium heat. 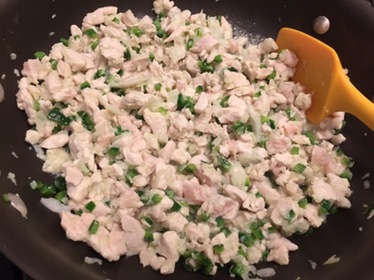 Add chicken, onion, poblano pepper, and saute 3 minutes. 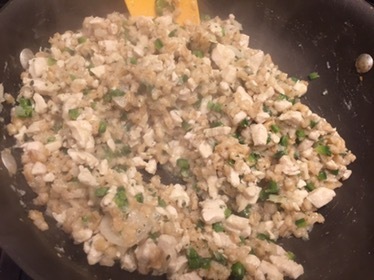 Add sage, salt and pepper, to taste, and cooked barley and stir to coat. 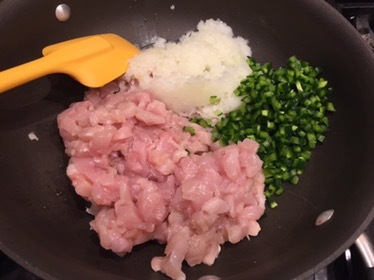 Cook, stirring constantly, until chicken is cooked through and mixture is well-combined. 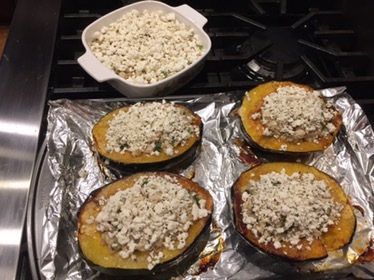 Spoon barley mixture into each halved squash then top with goat cheese. 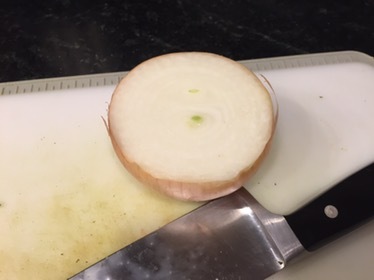 Bake for 5 to 7 minutes, or until cheese is lightly browned. Heat 2 cups chicken stock in a small saucepan over medium-high heat. 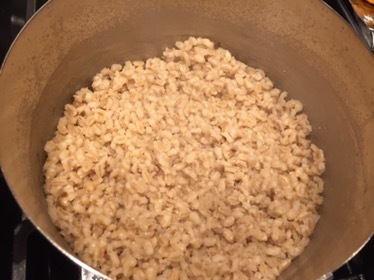 Add the barley and simmer until tender, about 8 to 10 minutes.